Einrichtung von Energiedepots, Klinkersteine als "Sender"
Mechanism of energy depots, clinker brick as "sender"
Continuation of Soeder's experiments, influence of the environment on characteristics of the sender. Mit der Resonzantenne lassen sich einfache Experimente aufbauen, die die Ausbreitungseigenschaften der Wellen untersuchen. In den ersten Versuchen zeigte sich tatsächlich, daß Vakuum die Ausbreitung der Wellen verhindert, so wie es auch Wüst beschrieben hat. With the resonance antenne simple experiments can be developed, which examine the propagation characteristics of the waves. The first experiments showed up that vacuum prevents the propagation of the waves, as it also Wuest already described. 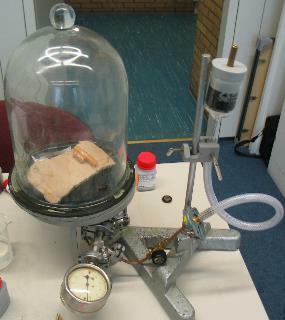 Experiment: Resonanzprobe in Vakuumglocke, Vakuum das Objekt wird "unsichtbar" vacuum, "object invisible"
Experiment: Resonanzprobe in Vakuumglocke mit CO2 gefüllt, das Objekt wird "unsichtbar" CO2 "object invisible"
Experiment: Resonanzprobe in Quarzrohr und mit Luft (Abb.10) das Objekt wird "unsichtbar" quartz tube, air "object invisible"
d.h. mit Luftsauerstoff, aber ohne Ozon bleibt das Objekt "sichtbar". ozone the object remains "visible". Offensichtlich sind die Sauerstoffatome in der Luft für die Ausbreitung der Wellen erforderlich. Obviously the atoms of the atmospheric oxygen are neccessary for the propagation of the wave. 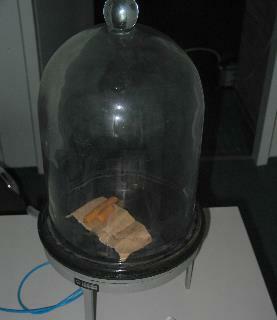 /Wesselborg 1991/ Versuche mit Sender in Vakuumglocke experiment with sender in a vaccuum chamber. 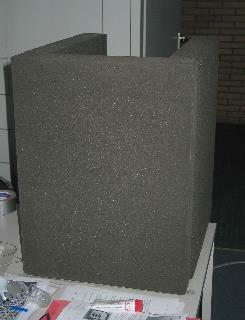 Shielding by foam glass plates and cork plates or silk can be detected. Wurde zwischen beide Hände eine Zelluloidplatte gestellt, so daß das Feld, in dem sich die Rute bewegen sollte, gestört war, so unterblieb der Ausschlag. If between both hands a celluloid plate was placed, so that the field, in which the rod should move, was disturbed, then the deflection was omitted. Also the disturbance of the field from the outside by approach of magnetic poles of opposite sign to the hands of the dowser (north pole to south-magnetoide right hand, south pole to north-magnetoide left hand) prevented each turning of the rod, while the approach of poles of the same name remained without influence (p. 396). Likewise the rod did not react, if by engagement of impedances into the rod the shift of the magnetoid energy were prevented (p. 409) or if one by short circuit not let take place the shift in the magnetoiden field between the hands (p.408)"
«I then covered a large area of the floor of one of my laboratories with aluminium foil. It was rendered quite dead to dowsing responses. «Six widely separated acquaintances were asked to cover the soles of their shoes with aluminium foil, and then carry dowsing rods across a structure they had previously dowsed. None had prior knowledge of what to expect. Each found that the rods did not rotate. Two found, by chance, that they rotated weakly if there was a small hole in the foil, and this strengthened when the hole was made larger. Dowsing rods are simple ors which anyone can use, but the dowsing field is clearly a problem for physicists. More interferometry is needed, as are rods with inclinometers and torque meters, and experiments with a wider range of materials. "If the interferometer is shielded from the sun by aluminium foil or crossed sheets of stretched polyethylene film, the pattern disappears. 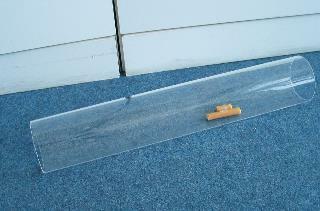 About this time an article by two Russian authors, Nachalov and Parkhomov, appeared on the Internet reporting that stretched polyethylene film (commonly used as 'clingfilm' in Britain for wrapping food) polarises torsion radiation, a comprehensive term used by them and their colleagues that supposedly includes fields produced by rotating masses. This seemed to me then to be a remarkable discovery, and still does. I was sufficiently suspicious to want to confirm it and that was easily done by polarising the field by reflection with aluminium and cross-polarising by transmission through stretched polyethylene film, which eliminated the field (having first established that the film transmitted the unpolarised field)." Gestrecktes Polyethylen polarisiert die Strahlung von rotierenden Körpern. Reddish hat diese Aussage von zwei russischen Autoren Nachalov und Parkhomov mit an Aluminium reflektierter Strahlung bestätigen können. Aran: http://www.springerlink.com/content/mu31872g276x2n74/ Titel= Arangehalt in der Luft und Glaukom ?????? siehe oben: keine Ausbreitung in Luft ohne Sauerstoff! hier genau umgekehrt, Quarz läßt Information durch, Glas sperrt bakterien ????? mögliche Ursache: Seitenwind für Rutenausschlag oder seitliche Verschiebung der spürbaren Störzonen ? The biolocation search method (BLM) consists in using the BLE (biolocation effect) to locate the object being sought. 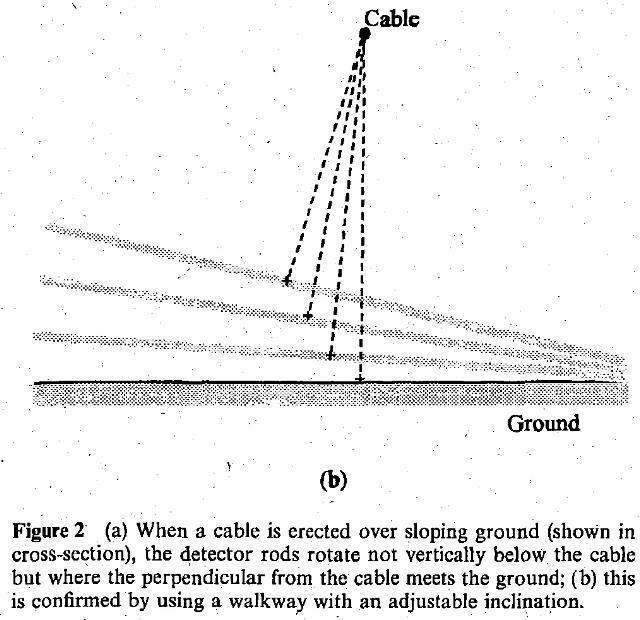 Many times the author has been amazed and thrilled to observe the strong turning of a dowsing loop in an airplane flying over a biolocation anomaly at an altitude of 10 kilometers, the BLE being a large water-saturated anticlinal mountain. "Nikolai N. Socevanov, doctor of geology and mineralogy, today a prominent expert for geochemical prospecting at the Ministry for geology of the USSR, opened a new epoch of the Soviet dowsing in the year 1966. It submitted its realizations to several scientific societies in Leningrad. Socevanov described the examination of the ability for dowsing of 40 test subjects, at least four were capable exactly of locating flowing water which hydrauliclied according to by an enormous up-poured earth dam seeped." durch Abschirmen mit der Handfläche oder durch Ziehen eines "virtuellen Striches" in der Luft? Mit Hilfe von kleinen Störobjekten (Kupferbügel), die sie auf den Boden bei einem Kreuzungspunkt oder einer Linie legen, sind sie in der Lage, die Intensität des Gitters auf der Seite "hinter" der Störung zu verringern?? Experienced dowser (e.g. Friedrich.E.) can indicate, from which direction the energy of a grid network comes, by shielding with the palm or by pulling a "virtual line" in the air? 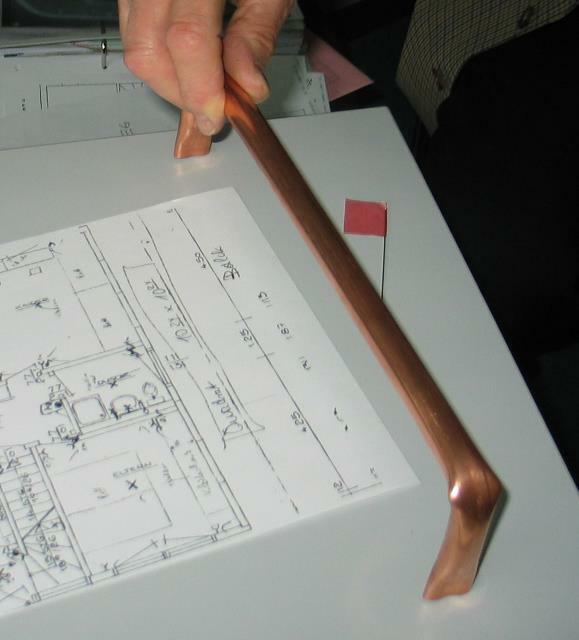 By small obstacles (copper handles), which are put on the ground with a crossover or a line, they are it able to reduce the intensity of the grids on that side behind the obstacle. Abb. 01a: Ein Kabel hängt über einer neigbaren Oberfläche. Es erzeugt ein spürbares Beugungsmuster. Dieses Muster "unterhalb" des Kabels wandert mit - wie eine Spiegelbild - beim Neigen der Oberfläche. Abb. 01b: In einem Gebäude mit mehreren Etagen wird das spürbare Muster über einer geologischen Störung aufgenommen. Es gibt offensichtlich zwei Zonen, die etwa mit gleichem Abstand zueinander sich nach oben verfolgen lassen. Die Hauptrichtung ist nicht exakt senkrecht. Der Neigungswinkel beträgt etwa 2 Meter auf 14 Meter Höhenunterschied. In a building with several floors the perceiveable pattern over a geological disturbance is taken up. There are obviously two zones, which can be pursued for instance with same distance to each other upward. The main direction is not accurately perpendicular. The angle of inclination amounts to about 2 meters on 14 meters difference in height. Busscher: Zithersaite und "Wüst-Wellen" : mit "zugestopften" Ohren (Gehörschutz) gibt es bessere Sensibilität. Experiment: Wechselwirkung Schall ----> "Wüst-Wellen" ----> Schall ??????? Wechselwirkung Elektromagnetisch ----> "Wüst-Wellen" ----> elektromagnetisch ?????? Stehende elektromagnetische Wellen können lokale "Brechungsindexveränderungen" verursachen und damit die Reflexionsflächen für stehende Wüst-Wellen sein?????? /Schumacher 1992/ S. 9 Glas- und Kunststofflinsen sind geeignet, einen Parallelstrahl zu erzeugen. « The pattern decay effect makes it clear that sufficient time must be allowed, after making any change to the interferometer, for the previous pattern to decay completely and the new one to become fully esablished. « Lediglich bei Holzschichten über 1 cm Dicke war ein gewisser Verzögerungseffekt bemerkbar, insofern, als nach dem Bedecken der Stoffprobe mit einer 1 cm dicken Sperrholzplatte die Wirkung auf die oberhalb der Platte gehaltene Rute erst nach etwa 10 Sek. einsetzte. Blieb jedoch die Platte längere Zeit über dem Stoff liegen, so erfolgte beim späteren Darüberhalten der Rute der Ausschlag sofort ohne jede Verzögerung. Es schien demnach, als handle es sich bei der Wirkung auf die Rute um eine Art Strahlung, die zum Durchdringen des Holzes einer bestimmten Zeit bedarf. Auf die Erscheinung fiel dadurch einiges Licht, daß das betreffende Holz ebenso wie Papier, wenn sie längere Zeit zum Bedecken einer Materialprobe benutzt oder sonstwie in nächster Nähe derselben gelegen oder mit ihr in Berührung gewesen waren, selbst für längere Zeit (bis zu 10 Min.) den für den betreffenden Stoff charakteristischen Ausschlag hervorriefen, gerade als wären sie mit einer Art radioaktiven Niederschlags bedeckt oder irgendwie spezifisch polarisiert worden. "Only with wood layers over 1 cm thickness was noticeable a certain delay effect, in as much as after covering the material sample with 1 cm used a thick plywood plate the effect on the rod held above the plate was starting only after approximately 10 sec. However if the plate remained for longer time over the material, then the deflection took place immediately without each delay with the rod was nearing the plate. It therefore seemed, as if there would be a kind of raditation with the effect on the rod, which requires a certain time for penetrating the wood. If the wood or the paper used for covering a sample had lain for longer time on such a material or in next proximity or had been with it in contact even for longer time (up to 10 min.) there was a deflection of the rod characteristic of the material, just so as if they would have been covered with a kind of atomic fall out or somehow specifically polarized. Diese Möglichkeit, die auf die Rute wirkende Energieform auch auf andere, die Rute sonst nicht beeinflussenden Stoffe zu übertragen, führte zur Arbeitshypothese, es handle sich bei der Wirkung von Stoffen auf die Rute um eine Strahlung, die von Primärstrahlern auf Nichtstrahler derart übertragen werden kann, daß diese selbst zu induzierten Sekundärstrahlern werden und die Rute in der gleichen Weise beeinflussen, wie jene Primärstrahler. This led to the working hypothesis, the radiation can influence secondary radiation in materials which do not radiate normally. This type of radiation is detectable by the rod. Die Entscheidung, ob es sich bei dem genannten Effekt um eine Art radioaktiven Niederschlags oder um eine induzierte Polarisierung handelt, war dadurch möglich, daß die auf einen Nichtstrahler übertragene Energieform vollständig ausgelöscht werden konnte, wenn man die Oberfläche des Sekundärstrahlers mit einem weichen Tuch oder Papier intensiv abrieb. An dem zum Abreiben verwendeten Tuch war nachträglich mit der Rute nichts von jener Strahlung mehr nachweisbar, wie das beim Entfernen eines radioaktiven Niederschlags hätte der Fall sein müssen. Ebenso war die gleiche Stelle des Tuches beliebig oft zum Abreiben von Sekundärstrahlern verwendbar, ohne daß eine Anreicherung oder Sättigung des Tuches mit den weggewischten Strahlungsträgern eintrat. Es mußte demnach als Ursache der Sekundärstrahlung eine Art induzierter Polarisierung der Oberfläche in Frage kommen, sei es, daß die äußerste Kristallgitterschicht oder auch nur ihre Beladung mit adsorbierten Gasen, Ionen usw. irgendwie strukturell oder energetisch in reproduzierbarer Weise verändert wurde. "The decision, whether it concerns with the effect mentioned around a kind of atomic fall out or an induced polarization, was thereby possible that the form of energy transferred to a not radiant object could be completely extinguished, if one abrades the surface of the secondary emitter with a soft cloth or paper intensively. At the cloth used for abrading there was nothing of that radiation to be found by the rod later, as when removing an atomic fall out the case would have had to be. Likewise the same place of the cloth was arbitrarily often usable for abrading secondary emitters, without an enrichment or a saturation of the cloth with the wiped away radiation carriers entered. A kind of induced polarization of the surface had to therefore be applicable, is it as a cause of the scondary emission that the outermost crystal lattice layer or also only their loading with adsorbent gases, ions etc. was changed somehow structurally or energetically in reproducible way." In diesem Zusammenhang muß auf die oft beobachtete und in dieser Abhandlung mehrfach erwähnte Tatsache näher eingegangen werden, daß beliebige nichtstrahlende Stoffe durch Berührung mit einem W-Strahler in so eigenartiger Weise oberflächlich modifiziert, polarisiert oder, besser gesagt, "magnetoisiert" werden, daß sie danach längere Zeit die gleiche W-Strahlung aussenden, wie der magnetoisierende Körper. Diese induzierte Magnetoisierung ließ sich mit einem Tuch abwischen, ohne danach am Tuch nachweisbar zu sein. This induced magnetoising let itself wipe off with a cloth, without being provable thereafter at the cloth." "This effect can be only a surface change, or most probable a specific magnetoising of an adsorbent gas layer. Even if one considers that a straight-lined or in circles moving human leaves a magnetoising in the air, which the rod affects like a magnet affects. Furthermore that after some attempts the breathed out air of humans causes a rod deflection like a magnetic north pole, then here can only gaseous materials be applicable, which are magnetoised in the magnetoid field of humans. Our opinion is, that the paramagnetic oxygen of the air is the most probably reason for the effects." Da die Sensoren mit einer "automatischen Verstärkungsregelung" wie etwa das Auge mit seiner Pupille haben, werden sehr langsame Intensitätsänderungen "übersehen". Daher ist es sinnvoll, mit größerer Geschwindigkeit sich beim Suchen zu bewegen. Andererseits haben die Sensoren aber eine zeitliche Trägheit, so daß es sinnvoll ist, sich langsam zu bewegen. Zu schnelle Bewegung bewirkt eine örtliche Verschiebung bis die Reaktion eintritt, eine zu langsame schränkt die Empfindlichkeit ein. Since the sensors have an " automatic gain control" as for instance the eye with its pupil has, very slow changes of intensity are ignored. Therefore it is meaningful to move with larger speed on searching. On the other hand the sensors have however a temporal inertia, so that it is meaningful to move slowly. To fast movement causes a local shift until the reaction enters, a too slow limits sensitivity. «Dowsing literature has for many years referred to a factor known as "remanence" which enabled a dowser to locate the former site of an object which had been removed. This seemed an improbable notion but, as described in the main text (p.64), something of this nature has been shown to exist, giving continuity to recovered plans. Whether or not this stems from a differential in the ionization of ground particles caused by the screening effect of a former object, is a problem for physics. Im Laufe der systematischen Erforschung von Störungen und Fehlerquellen bei Wünschelrutenuntersuchungen, die anläßlich der Vorbereitung von Vorführungen unserer vor 1 1/2 Jahren veröffentlichten Analysenmethoden (Roux' Archiv 131, 389-482 1934) unter Leitung von J. Wüst und J. Wimmer als Rutler in der Abteilung für experimentelle Biologie der Münchener Anatomie (Abteilungsvorstand: Prof. Dr. B. Romeis) durchgeführt wurden, ergaben sich folgende Beobachtungen, die unseres Erachtens für die weitere Bearbeitung des Wünschelrutenproblems wichtige Fingerzeige geben und möglicherweise für die endgültige Klärung desselben von grundlegender Bedeutung sind. In the course of the systematic research of disturbances and sources of error with dowsing methods, those on the occasion of the preparation of demonstrations of ours before 1 1/2 years published analysis methods (Roux' Archives 131, 389-482 1934) under the direction of J. Wüst and J. Wimmer as dowser in the department for experimental biology of Munich anatomy (department executive committee: Professor Dr. B. Romeis were accomplished), arose the following observations, which according to our judgement for the further treatment of the dowsing problems give important hints and are important for the possibly final clarifying of this problem. 1) Befanden sich in dem Raum, in dem der Rutler z. B. feinpulverisierte Salze analysierte, die Dämpfe leicht flüchtiger organischer Verbindungen (Benzol, Toluol, Xylol), so waren mit der Methode der spezifischen Sensibilisierung richtige Ergebnisse nicht zu erzielen. Der Rutler erhielt vielmehr über der Analysensubstanz wie über den Testobjekten (reine feste Metalle) nur dauernde Drehungen statt der sonstigen konstanten Ausschläge bestimmten Drehwinkels. Wurde der Raum gründlich durchgelüftet und wurden die Test- und Analysesubstanzen im Vakuum einer Wasserstrahlpumpe schwach erwärmt, so verschwanden die Störungen und waren richtige Analysen auszuführen. Were in the area, in which the dowser analyzed salts e.g. fine-pulverized, steams of easily volatile organic compounds (benzene, toluol, xylene), then correct results were not to be obtained with the method of the specific sensitization. The dowser received rather over the analyzed substance as over the test objects (pure firm of metals) only continuing turns instead of the other constant deflections of determined angle of rotation. If the area was thoroughly aired and if the test and analysis substances in the vacuum of a water-operated vacuum pump were weakly warmed up, then the disturbances disappeared and correct analyses were possible. 2) Wurden horizontal liegende runde Metallplatten, z. B. aus Kupfer-, Blei oder Aluminiumblech, mittels eines Schallplattentriebwerkes in Drehung versetzt (50-100 Umdrehungen/min. ), so machte die Rute über den rotierenden Platten, unabhängig vom Material derselben und unabhängig von einer etwaigen vorherigen Sensibilisierung des Rutlers, nur dauernde Drehungen nach aufwärts, um so rascher, je schneller die Plattendrehung erfolgte. Über den ruhenden Platten ergaben sich die für das betreffende Material charakteristischen konstanten Ausschläge definierten Drehwinkels. Die Rute verhält sich über diesen bewegten metallischen Systemen ähnlich wie über bewegtem (strömendem) Wasser, wo bei Wimmer dauernde Drehungen nach aufwärts erfolgen, während sich über ruhendem Wasser ein konstanter Ausschlag von - 90° einstellt. If horizontal lying round metal plates, e.g. from copper, lead or aluminum plate, were rotated by means of a record engine in turn (50-100 revolutions/min. ), then the rod over the rotary plates, independent of the material the same and independently of a any previous sensitization of the dowser, makes only turns upward, and the more rapidly, the faster the disk turns. Over the resting plates the constant deflections of defined angle of rotation resulted according to the characteristic of the material . The rod behaves over these moved metallic systems similarly as over moved (flowing) water, where with Wimmer lasting turns upward took place , during iover resting water a constant excursion of - 90° could be detected. 3) Waren die Wände des Versuchsraumes durch laufende schwere Maschinen oder durch Sturm erschüttert und in niederfrequente Schwingungen versetzt, so traten ebenfalls nur dauernde Drehungen der Rute auf. If the walls of the test section were shaken by current heavy machines or by storm and transferred into low-frequency oscillations, then likewise only continuing turns of the rod arose. 4) In gleicher Weise reagierte die Rute auf Töne aller Art, z. B. auf Klavierspiel oder auf einen tönenden Lautsprecher. Mittels elektrisch wiedergegebener Tonfrequenzplatten wurde festgestellt, daß der mit den betreffenden Platten wiedergegebene Frequenzbereich von 30-10 000 Hertz in seiner ganzen Ausdehnung in der angegebenen Weise wirksam war. Die Rute drehte sich dabei um so rascher, je höher die Tonfrequenz war. In the same way the rod reacted to tones of all kinds, e.g. to piano play or to a sounding loudspeaker. By means of electrically driven record engine it was stated that the complete frequency range was effective 30-10 000 Hertz in its whole expansion. 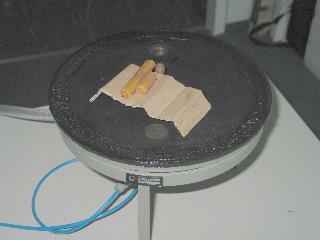 The rod turned thereby more rapid, the audio frequency was higher. 5) In der Nähe der stromführenden Gleichstromleitungen gab die Rute konstante Ausschläge von + oder - 90°, je nach der Stellung des Rutlers zur Stromrichtung. In der Nähe von Wechselstromleitungen erfolgten dauernde Rutendrehungen. Bei Hochspannungsleitungen begann im Gelände die Rute schon in einem Abstand von etwa 50 Meter in der angegebenen Weise zu reagieren. In of the proximity of the energized direct current lines the rod gave constant deflections of + or - to 90°, depending upon the position of the dowser to the direction of current. In close proximity to alternating current lines continuing turns of the rod took place. With high voltage transmission lines the rod began to react in a distance of approximately 50 meters in the indicated way. 6) Wurde ein versilberter Kupferdraht, der keinen Ausschlag hervorruft, einseitig an eine konstante Gleichspannung angeschlossen, so blieb die Rute entlang seiner ganzen Ausdehnung und über seinem freien Ende bewegungslos. Bei Anschluß des Drahtes an eine Wechselspannung erfolgten über dem Draht und seinem Ende dauernde Rutendrehungen. If a silvered copper wire, which does not cause a moving of the rod, was on one side attached to constant DC voltage, then the rod remained motionless along its whole expansion and over its free end. When connecting the wire to an alternating voltage the rod turned continuously by the wire and its end. 7) Bei Anschluß des Drahtes an pulsierende Gleichspannungen, die mit dem Schallplattenpantostaten von Siemens und Tonfrequenzplatten erzeugt wurden, gab die mit dem linken Ende auf dem Draht schleifende Rute in bestimmten Abständen und außerdem am freien Drahtende gleichsinnige Ausschläge von + oder - 90°, je nachdem der positive oder negative Pol angeschlossen war. Der gegenseitige Abstand der Ausschlagstellen betrug bei 30 Hz 11,5 cm, bei 40 Hz 8,2 cm, bei 60 Hz 5,6 cm, bei 100 Hz 3,2 cm und bei 200 Hz 1,7 cm. Bei höheren Frequenzen rückten die Ausschläge noch näher aneinander und über 800 Herz ergaben sich längs des ganzen Drahtes nur dauernde Rutendrehungen. Der Rutler wußte in keinem Fall, welche Frequenz gerade zur Untersuchung stand. When connecting the wire to pulsating DC voltages, which were produced with the Schallplattenpantostaten by Siemens and venyl records, the rod in certain distances and in addition at the free wire end, sharpening with the left end on the wire, gave deflections in the same direction of + or - 90°, depending on the positive or negative pole was attached. The mutual distance of the deflection places amounted to with 30 cycles per second 11.5 cm, with 40 cycles per second of 8.2 cm, with 60 cycles per second of 5.6 cm, with 100 cycles per second of 3.2 cm and with 200 cycles per second of 1.7 cm. With higher frequencies the deflections moved still more near together and over 800 cycles per second arose along the whole wire only continuing rod turns. The dowser knew in no case, which frequency was adjustedfor the investigation. 8) Wurde bei den Versuchen mit der pulsierenden Gleichspannung senkrecht zur Drahtrichtung eine Schlitzblende aus Celluloid aufgestellt, durch deren Mitte der Draht hindurchlief, so unterblieben längs des Drahtstückes zwischen Blende und freiem Ende die Ausschläge, wenn die Blendenweite weniger als die Hälfte des Abstandes zweier aufeinanderfolgender Maxima betrug. If with the experiments with pulsating DC voltage perpendicularly to the wire direction a slit from celluloid was set up, whose center the wire traveled through, then the deflections are omitted along the piece of wire between screen and free end, if the screen width amounted to less than half of the distance of two successive maxima. 9) Alle die in 2) bis 7) beschriebenen, von mechanisch oder elektrisch schwingenden Systemen ausgehenden Wirkungen auf die Rute konnten unterbunden werden, wenn zwischen das schwingende System und die Rute eine sog. „magnetische Abschirmebene" oder Seide, Kunstseide bezw. Celluloid eingeschaltet wurde. All in 2) to 7) described, from mechanical or electrically swinging systems outgoing effects on the rod could be prevented, if between the oscillating system and the rod a so-called „magnetic shielding level" MSL or silk, artifical silk resp. Celluloid was placed. 10) Ließ man die von einem Stoff ausgehende rutenwirksame Strahlung (W-Strahlung) unter 45° auf eine "magnetische Abschirmebene" fallen, so wurde sie um 90° nach der Seite abgelenkt, wie bei Reflexion nach den normalen Reflexionsgesetzen. Oberhalb der "Abschirmebene" war mit der Rute keine W-Strahlung mehr nachweisbar. Bei der Wirkung der "magnetischen Abschirmebene" handelt es sich also um einen Reflexionsvorgang. Es wird daher künftig der physikalische Ausdruck "magnetische Reflexionsebene" gebraucht werden. 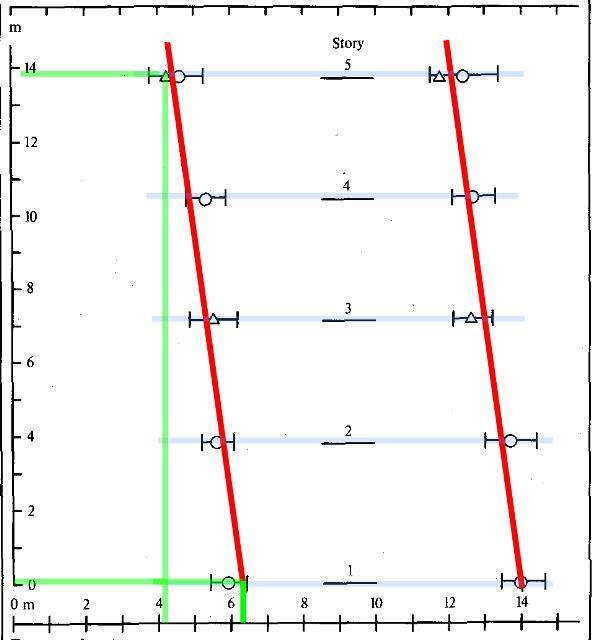 If one let the rod-effective radiation (W-radiation) fall under 45°, outgoing from a material, on to an MSL, then it was diverted around 90° after the side, as with reflection according the normal reflection laws. Above this MSL no W-radiation was more provable with the rod. With the effect of MSL thus a reflection procedure concernes. It is from there in the future the physical expression MSL is used. 11) Wurde mit einem Ventilator ein rascher Luftstrom über auf die Rute wirkende Substanz (W-Strahler) geblasen, so unterblieb der normale Ausschlag senkrecht über der Substanz; dagegen trat seitlich davon in dem darüber gestrichenen Luftstrom ein Ausschlag auf, der nach Größe und Richtung mit dem normalen übereinstimmte. When with a rapid air flow by a fan was blown over the substance working the rod (W-emitter), then the normal deflection was omitted perpendicularly over the substance; on the other hand laterally of it an deflection arose in the air flow, which after size and direction agreed with the normal. 12) Wurde ein Silberplättchen mittels eines Glasträgers in der Mitte eines Rundkolbens von 16 mm Durchmesser befestigt, der aus einem für W-Strahlung durchlässigem Glas bestand, so gab die außen über den Kolben gehaltene Rute nach spezifischer Sensibilisierung des Rutlers auf Silber den normalen Silberausschlag, wenn der Kolben mit atmosphärischer Luft von 720 mm und 20° C gefüllt war. Der Ausschlag erfolgte merklich träger, wenn die luft auf 20 mm verdünnt war. Er unterblieb vollständig nach Evakuierung auf eine Zehntausendstel mm Hg. If a small silver plate was fastened by means of a glass base in the center of a piston by 16 mm in diameter, which consisted of one for W-radiation permeable glass, then the rod held over the pistons outside gave the normal silver deflection after specific sensitization of the dowser on silver, if the piston were filled with atmospheric air by 720 mm and 20° C. The excursion took place perceiveably lazier, if air on 20 mm were diluted. It was omitted completely after evacuation on to ten thousandths mm Hg. 13) War der gleiche Kolben mit Lindeschem Bombenstickstoff gefüllt, der 1% Sauerstoff enthielt, so gab die Rute nur ganz träge, kraftlose Ausschläge. Nach Füllung mit ganz reinem trockenen Stickstoff, der kohlendioxyd- und sauerstoffrei war, unterblieb wieder der Silberausschlag wie bei Hochvakuum. If the same piston was filled with Linde bomb nitrogen, which contained 1% oxygen, then the rod gave only completely slow-acting, strengthless deflections. 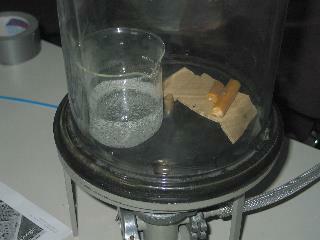 After filling with completely pure dry nitrogen, which was free of carbon dioxide and oxygen, again the silver deflection was omitted as with high vacuum. 14) War der Kolben mit trockenem kohlendioxydfreiem Sauerstoff gefüllt, so erfolgten ebenso rasche und kräftige Ausschläge wie bei Füllung mit atmosphärischer Luft. If the piston was filled with dry carbon dioxide-free oxygen, then just as rapid and strong excursions took place as with filling with atmospheric air. Kabelkanal als "Sender" in Plastikfolie bringen, die mit Stickstoff, Kohlendioxid,. . . gefüllt ist. Globalnetzgitter läßt sich auch untertage nachweisen. Vibrationen in der Luft durch Schallgeber können die Ausbreitung der Wellen beeinflussen, d.h. auch Strukturen im Überträgermedium erzeugen. «Im Zentrum steht die Tatsache, dass sich das NO-System durch magnetische und elektromagnetische Schwingungen beeinflussen lässt und im schlimmsten Fall vollkommen durcheinander gerät und schließlich als Zerstörer von Molekülfunktionen arbeitet. zukünftiges Experiment: Kraftmessung auf Resonanzantenne ????? /Siebert 1964/ S. 182 hydromagnetische Wellen (Alfven-Wellen) in der Exosphäre. Hierbei wirkt das Magnetfeld als "Brechungsindex", da es die Geschwindigkeit der Wellen beeinflußt. Bereiche mit lokalen Magnetfeldänderungen können somit wie in der Optik als Grenzfläche wirken. Mit stehenden elektromagnetischen Wellen lassen sich stehende Alfven-Wellen erzeugen. Abb. 02a: Zwei Wachskerzen liegen auf einer Pappe über der Grundplatte der Vakuumapparatur. 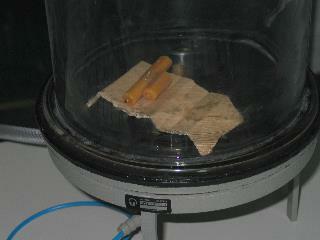 Two wax candles lie on a pasteboard over the baseplate of the vacuum equipment. Abb. 02b: Mit einer Glasglocke läßt sich ein evakuierbarer Raum herstellen. Gepumpt wurde mit einer zweistufigen Membranpumpe. 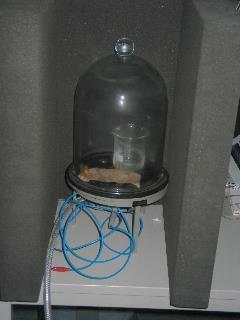 In this glass cover an evacuable volume can be made by pumping with a two-stage diaphragm pump. The candle stumps in the vacuum. Abb. 04: Zusätzlich steht ein Topf mit Wasser in der Vakuumglocke. 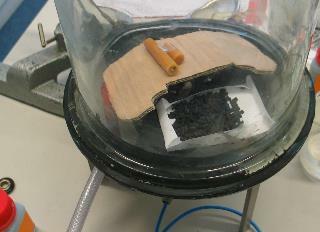 Beim Abpumpen bleibt ein Restdruck von Wasser in der Glocke. Der Druck beträgt dann 23 Millibar bei 20 Grad, Raumtemperatur. Wasserdampf ermöglicht die Übertragung der Wellen nicht. Additionally a cup with water is located in the vacuum chamber. When evacuating a residual pressure of water remaines in the cover. The pressure amounts then to 23 millibars with 20 degrees, ambient temperature. Water vapour does not make the propagation of the waves possible. 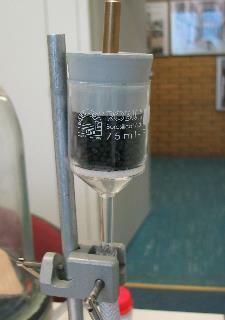 activated charcoal in the intake pipe. Abb. 11: Ein Fahrradhelm auf dem Kopf verringert die Empfindlichkeit bei der "natürlichen Methode" erheblich. Das Material besteht aus dünnem Glasfaserkunststoff (Abdeckung) und massivem Styropor. Für die Belüftung gibt es Schlitze ohne jegliches Material. 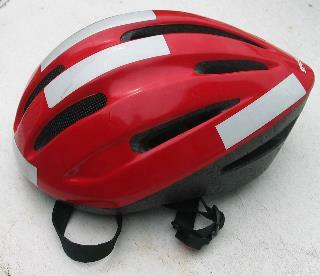 A bicycle helmet on the head reduces sensitivity with natural methode substantially. The material consists of thin glass-fiber reinforced plastic (cover) and solid polystyrene. For the ventilation there are slots without any material.